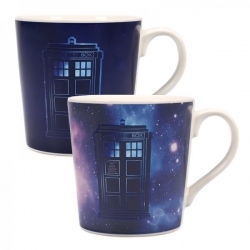 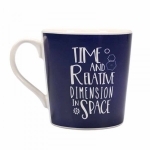 Take a jounrey through time and space with this awesome Dr Who heat changing mug. 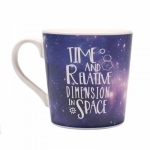 When cold, the front of the mug shows the Tardis and the back shows the words "Time And Relative Dimension In Space", all on a deep blue background. When hot liquid is poured in, the mug transforms to reveal a beautiful galaxy background of blues, purples and pinks. Once the drink is finished the mug returns to its original state as it cools.